Playing cards in dreams. Symbolic meaning and interpretation. What does it mean to dream to see so many playing cards on a table? And what does it mean to dream of being invited to play cards in an unknown house, away from the city and with people we do not know? What is the meaning of dreams in which we lose a lot of money playing cards with friends? Why can we dream of colored cards or dream of tearing, tearing, burning a deck of cards? And what does it mean to dream of having fake cards or reading tarot cards? What does it mean to dream of finding or printing playing cards? Why can we win with some French playing cards? Dreaming of dirty, cut, make-up cards, cards with flower seeds, money, spades, hearts. Why can we see a lot of playing cards or play cards and lose a lot of money? Have you ever dreamed of winning a friend's or co-worker's house by making a bet? What does it mean to dream of a big playing card or challenge someone to cards? Why is it possible to dream of choosing a strange deck of cards? What does it mean to dream of playing cards alone? What kind of numbers can we play with the Neapolitan grimace if we want to play the lottery when we dream of being with some friends and playing poker cards, trying to win a little money, following what the guide and the dream book says? "Last night I remember dreaming of winning a good amount of money playing with my parents. Last night I dreamed of losing a lot of money while playing cards with a colleague of mine and with some relatives, uncles, nephews, brothers and sisters. The other night I dreamed of being arrested because I was playing in a clandestine gambling den. This night I dreamed of buying a very beautiful and precious deck of cards in a store". Today we see what is hidden behind those dreams in which we can play with someone using playing cards. Very often, in fact, it is possible to dream of being together with some people that maybe we do not know while we play cards. What message is hidden behind these strange dreams? Let's try to understand the real meaning of this kind of dreams that is quite common. Playing cards in our dreams can be difficult to interpret. They can indicate many things. First of all we need to understand if the dreamer is a player, if the dreamer likes to play with friends or likes to bet often because, in this case, in his dream world, his hobby, his desire to play can manifest itself through the display of tables game, salt where you can bet and play with other people. If instead the dreamer is not a fierce player then the meaning can be much more important. Maybe we have never played cards yet we can dream of being seated around a table, along with other people with whom we play a game, perhaps even betting money. The cards represent a game with which we can have fun and in fact, often, when we do this kind of dreams, the meaning is really very trivial and behind we can find a fun situation that will happen in our lives. So we can play cards with friends and in real life we ? ?can be invited to a party, we can go out with someone and spend a few hours of complete fun and relaxation. Dreams much more difficult to interpret are those in which we have a series of cards in hand that are not very positive and could make us lose and so we try to cheat, ie we try to cheat the other players. We are hiding a secret, we are hiding something, we do not tell the whole truth about a situation we are experiencing. Here in our dream world then we try to cheat to hide a series of very unlucky cards. And if instead our playing cards are very positive, maybe we have a joker, a series of aces, then we can hope to achieve a good result in our life, we can achieve something, have a small or big job opportunity and be very lucky . In fact, winning a game of cards often symbolizes a victory in life, a goal that can be achieved, a very positive thing, an evolution and maturation. Incredibly in our dreams we could also have good playing cards in hand but we decide to tear them, to burn them, to throw them away. When we rip a card, throw away a playing card in the trash or burn a whole bunch of cards, then we risk turning away from us some opportunities that could be very important. Even if the fire very often indicates renewal, the closure of a period for the arrival of a new period, in this case we are simply rejecting a possible fortunate situation that could come. Here is another key word that can be essential to understand this kind of dreams: Chaos. Luck, very often, is connected with chaos, that is, with events that can come unexpectedly without us being able to do anything. We can not intervene and we simply have to suffer the situations that arrive. And therefore to see playing cards in a dream means precisely that we could be at the mercy of events, without being able to do anything in our lives and without being able to intervene by deciding some solutions. So this oneiric symbolism can represent an unexpected event, a sudden event that we must necessarily accept. If the card is a positive card, such as an ace or a joker then the event that comes in may be very lucky. Another widespread dream in which playing cards are fundamental concerns the symbol we can find on them. According to a symbolism that is lost in the mists of time, in the ancient peoples of human history, the seeds of flowers represent money, the seeds of hearts represent the feelings, the seeds of pictures indicate the work and the seeds of spades signal problems, obstacles. Here in our dream world remember the seed of the cards is very important because we could understand the origin of a possible problem to be addressed. So if most of the playing cards we have in hand are made up of suits, then the dream tells us about a working situation we are facing and that could be positive or negative, obviously based on the type of cards. 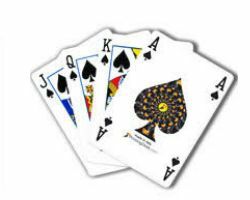 Owning two, three or four aces in the hand means that we could receive good business news, possessing other cards that can make us lose the game could mean professional problems. The seeds of flowers indicate instead economic problems or significant gains, situations that can make us gain especially if we can win the game with that type of cards. The seeds of spades, on the other hand, can be the ones that can do much more fear because they represent professional obstacles, work-related obstacles, obstacles in any sector of our life. Here we must try to understand the obstacle we have on our path and look for a solution to overcome it. And the seeds of hearts? The seeds of hearts symbolize the emotions, the interpersonal relationships, the feelings we feed towards a person, the love we can feel towards our wife, our husband, our son, our lovers. Very often, during this type of dreams, we can see just the person we love or that we like so much, the man or the woman who attract us, that attract us and in fact never forget that in dreams remember every place, detail, object , person is very important to provide a correct interpretation. For example we can dream of being in the workplace and playing cards with some colleagues and it is obvious that the problems to be faced are at work and not in the family while if we play with a person of our family, with our wife, with our husband, with our son and we lose or we have cards with spade seeds, we could have relationship problems, sentimental problems, interpersonal problems to solve. We conclude this article also describing the meaning of dreams in which we lose a lot of money to the game. Widespread dreams that indicate fears of the future, the fear of not being able to sustain a life that we think can be very complex.